Life-cycle of Theileria parva. 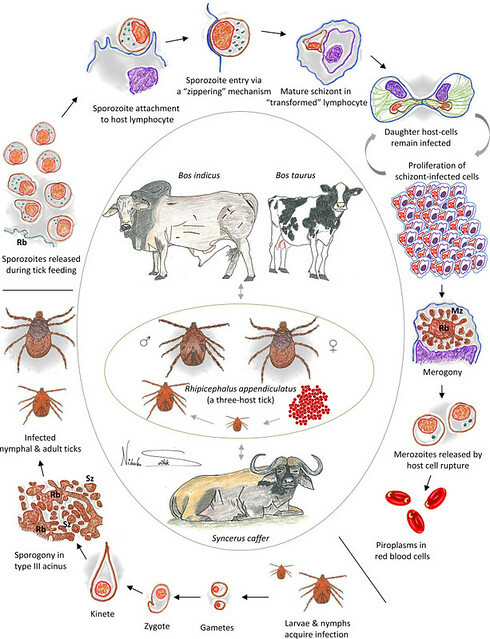 This figure illustrates the different life cycle stages of the single-celled tick-transmitted Theileria parva parasite, which causes East Coast fever in cattle. The parasite undergoes transformations into different forms as it cycles through its mammalian and tick hosts. The figure, created by ILRI scientist Nicholas Svitek, was inspired by fluorescence and electron micrograph images of the parasite life cycle (Fawcett et al., 1982a, Norval et al., 1992, von Schubert et al., 2010). Here’s what’s going on in this complicated, and complex, parasite life cycle: Within minutes of their injection by an infected tick into a cow, parasite forms known as ‘sporozoites’ zip open the membrane of the white blood cells (lymphocytes) of the cow to gain entry. Once safely inside, where the parasite is out of reach of attack by the cow’s immune system, the parasites develop to a ‘schizont’ stage, a process that results in genetic ‘transformation’ of the bovine cell, in which it acquires the properties of cancer and begins to divide, along with the parasites inside of it, endlessly. (T. parva is the only eukaryotic organism known to transform lymphocytes.) Some of the schizont parasite forms then undergo merogony, giving rise to yet another form of the parasite, called merozoites, which cause their host’s white cells to rupture, after which the parasites further mature into ‘piroplasm’ forms, which invade the cow’s red blood cells, where they are then ready for uptake by ticks taking their next bloodmeal from the cow. Tick larvae and nymphs acquire an infection by feeding on infected cattle or buffalo, and transmit the parasite as the next tick instar, nymphs and adults. Kinete forms, the final products of the parasite’s sexual cycle, invade the tick salivary glands where sporogony occurs. Mature merozoites (Mz) and sporozoites (Sz) originate from a multinucleated residual body. Notes: Stages of the life cycles are not drawn to scale. The vertebrate host cell nucleus is coloured in purple and the parasite nucleus is in orange. Microspheres in sporozoites and micronemes in merozoites are depicted as small dark green dots inside the parasite. Host cell microtubules in the dividing schizont-infected cell are drawn in green. Drawings and artistic creation by ILRI scientist Nicholas Svitek. (This drawing illustrates a new ILRI paper, published by Elsevier under a Creative Commons licence, in Ticks and Tick-borne Diseases on 26 Feb 2016: doi:10.1016/j.ttbdis.2016.02.001). Tremendous research progress has been made over the last ten years to better control the deadly African disease of cattle known as East Coast fever. This disease is caused by a single-celled organism, Theileria parva, which is carried by some tick species. Cattle become infected when a tick carrying the parasite takes a blood-meal from the animal over several days. The disease was named for its importation into southern Africa by cattle that originated from the East Coast of Africa at the start of the 20th century. The parasite was named after Arnold Theiler, a Swiss veterinary researcher who had emigrated to South Africa, where he became famous for co-developing the first safe vaccine against the rinderpest cattle plague, an accomplishment that ushered in systematic, mission-orientated veterinary research in that country. Theiler, whose youngest son Max would later win the Nobel Prize for developing the yellow fever vaccine, was first to distinguish East Coast fever, then entirely unknown to science, in 1903. Cattle infected with the T. parva parasite develop a cancer-like disease manifested by high fever, swollen lymph nodes and lungs filled with excess fluid, which eventually literally drowns the animals, typically within just three weeks of infection. This remarkable protozoan has genes that enable it—within minutes of being injected into an animal—to attach itself to the surface of a cow’s white blood cell, ‘unzip’ the cell membrane and slip into the cell. Once inside the bovine cell, the parasite is unseen and safe from attack by the cow’s antibodies. T. parva then proceeds to take over the cell machinery. Activating the cow’s cell division pathway, it multiplies along with its host cell, causing the cancer-like state. Those animals that do not succumb to East Coast fever are thereafter immune to subsequent infections with the same strain of parasite. Such natural full recovery and immunity is what first piqued the interests of scientists, who reasoned that it must be possible to develop a vaccine that would provoke similar immune processes, thus providing cattle with life-long protection against the disease. The sequencing of the genome of the T. parva parasite, completed in 2005, and its publication in the scientific literature enabled scientists to thoroughly characterize the protozoan’s genetic makeup, including the diversity of the parasite’s antigenic molecules that provoke the cow’s immune system to generate protective antibodies and killer T cells that attack and clear the parasite from the host. This is the basis of an effective ‘infection-and-treatment’ (ITM) immunization method, in which live parasites are inoculated into cattle along with a long-acting antibiotic. A ‘Muguga cocktail’ ITM vaccine combining several parasite strains and providing broad-spectrum immunity to East Coast fever is now a registered product in three countries in eastern Africa. Effort today is being directed at improving and scaling up the production of this ‘live vaccine’ to make it more widely and cheaply available to the millions of people whose livelihoods depend on livestock in the twelve countries of eastern, central and southern Africa where the disease remains endemic. Meanwhile, research to develop a ‘subunit’ vaccine, which is based on bits of parasites rather than whole parasites, with the bits eliciting production of neutralizing antibodies and killer T cells, has been revived by a research consortium that is developing proof-of-concept for a next-generation East Coast fever vaccine. The pioneering genomic, molecular and immunological advances that are making this subunit vaccine work possible promise to finally and fully control this devastating disease within the next decade or so. The biology of Theileria parva and control of East Coast fever—Current status and future trends, 16 May 2016. Visualizing the life cycle of Theileria parva—parasite causing East Coast fever in cattle, 2 Jun 2016. Susan MacMillan leads ILRI’s Awareness and Advocacy communications work. Vish Nene leads ILRI’s Vaccine Biosciences program (ILVAC). Nicholas Svitek is a cellular immunologist within ILRI’s Vaccine Biosciences program. Tags: Nicholas Svitek, Vish Nene. Bookmark the permalink. Thanks to such breakthrough in history, the modern development of vaccine is much easier with various techniques. As I know there are a so called mini brain model can imitate the organism condition, replacing the involvement of animals while shortening the time span for the experiments. I looked up reference research, and found that the sequencing of the genome of the T. parva parasite, completed in 2005, and its publication in the scientific literature enabled scientists to thoroughly characterize the protozoan’s genetic makeup, including the diversity of the parasite’s antigenic molecules that provoke the cow’s immune system to generate protective antibodies and killer T cells that attack and clear the parasite from the host.